"Be Prepared to Make Your Own Health Decisions "
-	Resist contrived social pressure to vaccinate; make it your choice. Today, the US healthcare industry is run by a Medical Cartel composed of Federal regulators (such as the FDA, NIH, CDC) and giant Pharmaceutical companies posting sales in excess of half a trillion dollars a year. Patented vaccines, drugs and cancer therapy comprise the major portion of this cash flow, all vital to the gross profitability of the Cartel. Prevention and curing disease is of secondary importance. In fact, vaccines and chemo drugs assault the body's immune system leading to chronic disease, neurological disorders and even death. The book "Cancer Vortex" provides perspective on how the American Medical system was taken over by the Rockefellers at the start of the 20th century. They transformed what was a balanced approach in medicine to a strictly allopathic drug-based system while denouncing naturopaths as 'quacks'. Another noteworthy resource is the website NVIC which allows parents to look up various vaccines, their risks and the diseases they are intended to prevent. See the NVIC 49 Doses Poster for the schedule of excessive vaccinations which can cause an extreme immune reaction in the baby's undeveloped brain. The site also offers a database on State/Federal laws on mandatory vaccinations and shows the procedures for obtaining waivers. Our Autism Resource page has recently received a striking increase in hits especially from Twitter users. It's clear that Parents are desperate for honest information on the dangers of vaccines and how to protect their young children. Below is a summary of Dr Blaylock's main points but you must see the video itself to gain an appreciation for his neurological expertise, compassionate understanding of parents' plea for the truth and his bravado standing up to the medical bureaucrats who push vaccines without understanding or even caring about the risks involved. As an experienced Neurosurgeon familiar w/brain & neural networks, he explains how Immuno-Excitotoxicity can cause Autism & associated diseases. Excessive vaccines given to babies up to 24 months old can lead to inflammation of the brain w/symptoms such as rashes, screaming, memory loss, angry outbursts, depression, seizures, ADHD and other neurological disorders. During the same period, vaccinations increased from 10 (for children up to 6 years) to now 40 vaccinations for babies up to 24 months. This excessive rate of vaccination can cause over-stimulation of the brain's immune system, the Microglia which triggers release of excitotoxins that attack the neural pathways in the baby's undeveloped brain. This can lead to Autism or related disorders. Pediatricians today arrogantly push vaccines on parents with newborns without discussion of serious adverse effects. Recent scientific evidence shows 1% of vaccinated children have some form of neurological damage, signifying a tragedy for the whole family. Warning: The Flu vaccine given in pregnancy can affect the baby's brain and lead to autism or schizophrenia years later. Also soon after birth, babies are given the Hepatitis B shot, totally unnecessary yet extremely toxic which can cause a critical immune response, then possibly autism or even SIDS (Sudden Infant Death Syndrome). The toxins in vaccines can be especially harmful to a baby's undeveloped brain. Examples of such toxins are mercury, aluminum, formaldehyde, bacteria, MSG and viral contaminants undetected by vaccine suppliers. Live virus vaccines like the MMR are especially risky. By suppressing the immune system, babies are vulnerable to other diseases. Even though attenuated, such live viruses can persist for years and later cause asthma, diabetes or brain disorders. For example: the Live Polio Vaccine given to 90 million Americans in the 50's & 60's, accidentally included the SV40 carcinogenic virus from monkey kidneys. After its discovery the government tried to keep it secret. Recent studies show the SV40 is causing malignant tumors in thousands of human lungs, brains and lymph systems. Vaccines often cause the disease they are designed to prevent. After the 1970's, every new case of polio was caused by the Live Polio Vaccine itself. Many studies on thimerosal (ethyl mercury) have shown its toxicity to the brain. Even very small doses can cause chronic inflammation, yet doses given to babies are 80 times greater than limits set for adults. For 70 years, not one scientific safety study of thimerosal has been undertaken, yet they claim by phony epidemiological studies it is safe to use in vaccines. Dr Blaylock says when young he caught diseases like mumps, measles, rubella, chicken pox and the flu, with no serious side effects and yet benefited from lifetime immunity. His community held measles parties where neighbors brought their kids to be exposed to measles and get it over with. Contrast that to the ruckus over a recent measles 'epidemic' at Disneyland where some 87 children caught measles. Since it's a mild disease for children, this is an example of media hype and scare tactics to boost vaccination and industry profits. Yet the irony is that it's the vaccinated kids with limited immunity who commonly infect others. Each vaccine has its own risk factors and Dr Blaylock goes into some detail explaining these. For example, the HepB and combo vaccines like MMR and DTP cause the most adverse reactions in babies. The Flu vaccine contains thimerosal, toxic to the brain. Yet for babies under 24 months, the vaccine is totally ineffective. The makers anticipate each year which flu strain (out of over 300) will be the most likely one and even then it is seldom effective. 70% of doctors & nurses refuse to take it. Although the CDC exaggerates the number of flu related deaths each year, a 35 year study shows no reduction in the overall death rate by taking the flu vaccine. So why take the risk especially for babies? To understand vaccine risks better, Dr Blaylock recommends Neil Millers's "Vaccine Safety Manual". Also consult the NVIC Disease & Vaccines database. According to a recent AP press release "A measles outbreak that originated at Disneyland has grown to 87 cases". Apparently it is spreading slowly around the country and the media is blowing it up as if a major epidemic is at hand. This is sheer nonsense, especially as the older generation is well aware that measles is a mild childhood disease. Yet the media scare campaign helps promote mandatory vaccinations, thus increasing Big Pharma profits. A related article from VaccineImpact.com reports "Zero US Measles Deaths in 10 Years, but Over 100 Measles Vaccine Deaths". Clearly, it is the vaccinated who are taking the greater risk. Measles is now a hot topic across the nation, promoted by the media and Medical Cartel, calling for mandatory vaccinations while pitting pro-vaccers against anti-vaccers. This is typical 'divide and conquer' strategy carried out by the Ruling Elite in all matters from politics to wars to medicine, in which they are deeply involved. Top scientific panel comprising neurologists, biochemists and others discuss vaccine safety concerns. "Vaccine Vortex - Devouring Innocent Children"
During the last 30 years, the number of vaccines given to babies has quadrupled from 10 to over 40 on average and over 70 by school age. This rise is coincident with a dramatic increase in the number of Autism Spectrum Disorders. Shockingly, it isn't an increase in epidemic diseases causing this disaster but an increase in vaccinations, in effect - a pandemic of vaccines. Vaccines were first developed to prevent epidemics like smallpox. The basic theory was to inject a small sample of an attenuated virus into the body to stimulate antibodies in an attempt to jumpstart an immune response. However, it has often been found that injection of live viruses, even attenuated ones can cause the disease the vaccine was intended to prevent (as admitted by Dr Jonas Salk with the polio vaccine). After years of mandating the cowpox vaccine in England and Japan, the death rates skyrocketed and the vaccines were eventually stopped. In 1976, the Centers for Disease Control (CDC) sponsored a national vaccination campaign for the previously unheard of Swine Flu; in fact, there had not been a single case in the country except amongst pigs. Some months after President Ford endorsed the campaign on CBS TV, thousands started feeling the toxic effects of the vaccine and claims of paralysis resulted in lawsuits and damages against the drug companies totaling $1.3 billion. An even greater tragedy was the inadvertent inclusion of the SV40 cancer virus in the polio vaccines given to over 90 million Americans in the 1950's and '60's. Even after the virus was discovered, the government kept it secret and the national vaccine campaign continued its course. Over recent decades, tumors bearing the SV40 signature have been discovered in the lungs, brains and lymph systems of thousands of cancer patients. The US healthcare industry is run by a Medical Cartel encompassing Federal regulators (such as the FDA, NIH, CDC) and giant Pharmaceutical companies posting sales in excess of half a trillion dollars. Vaccines comprise a major portion of this cash flow as does Cancer Therapy. Both are vital to the gross profitability regardless of how many people are actually cured or immunized. 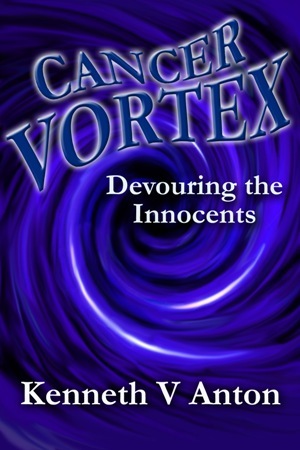 The book cover of "Cancer Vortex" shows the symbol of a swirling vortex, a death trap sucking innocent cancer patients into its core. It's a symbol of the cancer bureaucracy with its limited treatment options and deadly side effects: slash, burn and poison (surgery, radiation and chemo). Excising tumors does not cure the disease. It must be fought at the cellular level by boosting the immune system. Oncologists claim survival at 5 years is equivalent to a cure, yet only a small percent with malignant tumors, make it that far. In the book "Cancer Vortex", cancer patients are advised to avoid the 'vortex trap' and start making critical healthcare decisions on their own. They are urged to research and learn about the many proven natural cures available today from basic supplements and herb-based formulas to life-changing intensive nutrition and detox programs. Facing a rigid vaccine protocol, parents have an even more critical obligation to study the options and protect their babies especially with the radical increase in vaccines over the past 30 years and with more vaccines coming down the pipeline. The only logical reason for the rise in Autism and associated neurological disorders during these 30 years is the shocking increase in vaccinations, most of which are unnecessary. (For scientific research on this, see Dr Russell Blaylock's video and other resources at cancervortex.com/vaccinedangers1.htm ). Given that the current rate of autism is about 1 in 150 children and on the increase, it is imperative that parents educate themselves on the dangers of superfluous vaccinations and put a stop to this horrific tragedy. Starting with the flu shot given to pregnant mothers, then an Hepatitis B vaccine given to the newborn baby and followed by a cluster of around 40 vaccinations up to the age of 24 months, the current immunization procedure creates an overload on the baby's nascent immune system, especially its underdeveloped brain. Symptoms of impaired brain development may appear at any time, even years later. The risks of adverse side effects vary according to the vaccine, so one must evaluate each vaccine on its own merits and decide if the risk is worth the benefit. Several vaccines are typically given every 2 months after birth and require even more scrutiny as the adverse reactions can cascade. Seek out a pediatrician who is willing to help select which vaccines are safe and actually necessary. Also study the NVIC.org resources listed below. Realize that doctors may seem to have good intentions but they are still part of the Medical Cartel which prioritizes profit over health. They are bound to follow the strict protocols and agenda of the Cartel or they could lose their medical license. Be skeptical, do your own research and be prepared to make your own health decisions. The cozy relationship between the Food and Drug Administration (the primary government regulator), the Centers for Disease Control (main vaccine promoter) and Big Pharma is well known, as is the revolving door between the industry and the top ranks of the regulators. Billions are spent lobbying and much of that targets Congress every year. As proof, look at the 1986 bill preventing anyone from suing the vaccine manufacturers. Instead, a Vaccine Court under HHS Department auspices was set up to authorize any compensation should they determine it is due. This article opposes mandatory vaccinations without consent. Everyone should have the right to choose to be vaccinated when it comes to their own or their children's health. Nonetheless, some vaccines may be necessary in emergency situations such as to prevent anaphylactic shock, DVT and other types of blood clots, poisonous snake bites, rabid dog bites, insulin for diabetes etc. Without doubt, some vaccines have been proven to save lives in life-threatening situations. But it is the overuse of non-emergency vaccinations especially for babies with an undeveloped immune system, that demands close scrutiny and the consent of informed parents. "Cancer Vortex" promotes natural cures versus profit-based traditional cancer therapy. It highlights the immune system's role in defeating cancer at the cellular level. The chapter on Vaccinations warns of the serious risks they present especially to babies and young children and how that will affect future generations. "Cancer Vortex" by Kenneth Anton is currently available as a Kindle eBook and Paperback at Amazon.com The Paperback is also available thru Ingram worldwide distribution.